Here's what you should know about inherited risk for cancer. 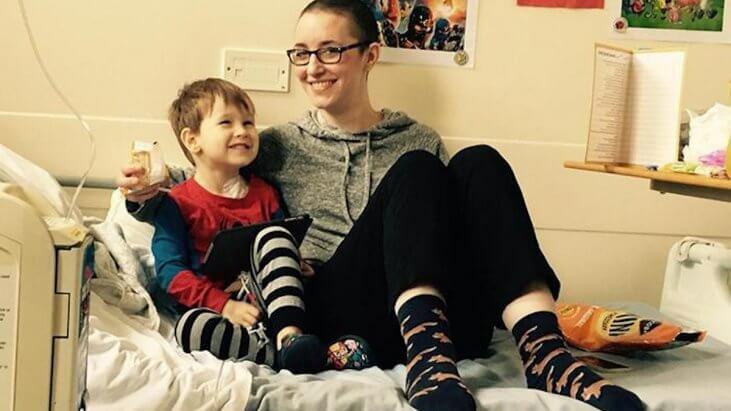 Being a young mom who just got diagnosed with cancer is hard enough, but for one mother, it got harder when her son was diagnosed with leukemia just five months later. Vici Rugby had stage 4 colorectal cancer and her three-year-old son George was then told, in the same hospital, that he had acute lymphoblastic leukemia. Both Vici and George are now in remission—and while this type of story is not very common, we do know that in some cases, cancer risk is inherited in genes. Having a family member with cancer doesn’t necessarily mean you’re more likely to get the disease, but there is a genetic factor for some people. The gene mutation means that genes that would usually protect our bodies from cancer by “correcting DNA damage that naturally occurs when cells divide,” are not working properly. Since people get half of their genes from their mother and half from their father, children have a 50% chance of inheriting this type of gene mutation if one parent has it. If you have a family history of cancer, it may be wise to look into genetic counseling, advises Rachel Webster, a Genetic Counselor at MD Anderson Cancer Center, which means discussing your history and risk for cancer with a specialist. “Genetic counselors have specialized training in order to figure out what genetic testing might be the most useful for you and your family,” she explains.